﻿ Full Tilt Poker is learning that lending your name to major poker tournaments doesn’t necessarily translate into increased attendance numbers. 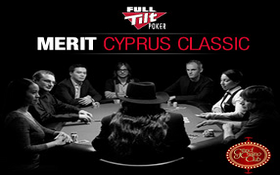 After 109 players took to the poker tables in Cyprus for Day 1a of the Full Tilt Poker Merit Cyprus Classic, only 71 players turned out for Day 1b of the tournament. The 180 total players failed to meet last year’s total of 181 when the tournament was a stop on the World Poker Tour. Prior to the tournament, Full Tilt officials were hoping for 250 players to take part in the Championship Event; even more cause for concern was the expectation for up to 80 players to take part in the $25,000 High-Roller tournament which kicked off the action on the 19th. The High-Roller event drew only 36 entrants –Although this is still a fairly impressive number for a $25k tournament. 140 players will return to the poker tables on Sunday for Day 2 of the tournament including Antonio Esfandiari, Sorel Mizzi, Karina Jett, Joe Cassidy, Carter Phillips, and the top four finishers in the High-Roller tournament who showed up late but were able to survive to Day 2: David Benyamine, Ori Miller, Andrew Feldman and Perica Bukara who won the event. This entry was posted on Sunday, August 22nd, 2010 at 6:18 am and is filed under Poker News. You can follow any responses to this entry through the RSS 2.0 feed. You can leave a response, or trackback from your own site.